Free agency isn’t all about the marquee signings and guys who can transform a franchise for the next several years. Sometimes, some of the biggest impacts can come from guys who sign for just one season because they are near the end of their NFL careers and teams don’t want to be on the hook for a player one year too long when he starts to decline. Gone are the days when Dwight Freeney was the most devastating pass-rusher in the game, but Freeney was so good in his prime that he can still bring the heat late in his career in a limited role. He keeps generating pressure everywhere he goes, and his spin move still has enough juice to catch almost any tackle off guard. He had 63 total pressures in 2016 on the way to Atlanta’s Super Bowl defeat, and despite playing only 227 snaps in 2017, he still notched 19 pressures. There are plenty of NFL defenses out there in need of additional pass-rush from their defensive front, and even if Freeney can’t handle a big workload anymore, he is a perfect situational rusher to carry on the roster and a phenomenal mentor for any young rushers on the team. Atlanta’s Adrian Clayborn – coming off a career year – credits Freeney with helping him improve his game last year. 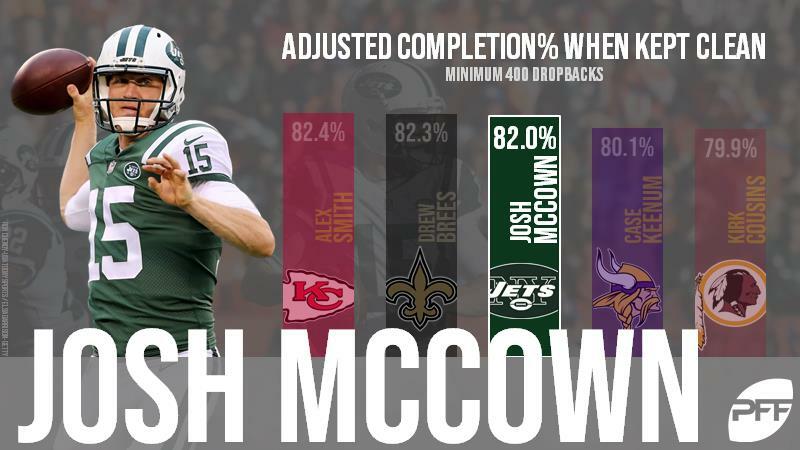 Josh McCown may well be capable of a longer and more expensive contract than a one-year deal given the quarterback market, but given his age, he should be in that ballpark. McCown may have had a career year in 2017 for the Jets in a season that was supposed to be quite terrible for the team on paper. McCown was efficient and actually had a passer rating of 102.3 when kept clean in the pocket over the season. He is unlikely to earn another legitimate starting job, but would be a perfect bridge quarterback to any rookie that needs some games on the sideline before being thrown in and would still represent one of the league’s best backups in case of injury. Like Freeney, Julius Peppers represents an all-time great who still has some gas in the tank and could help a team with an anemic pass-rush generate a little more heat for one season as part of their rotation. Peppers sacked the quarterback 13 times in 2017 and generated 34 total pressures over the season, and while that represented his lowest pass-rushing grade in years, it is still a significant return and that volume of pressure could be the difference for a team in contention. One of football’s true ageless players, Terence Newman played capably in coverage for the Vikings at 39 years of age. The year before, he was far better than capable, and actually posted some of the best advanced coverage numbers we have seen over the past decade, but at his age any sign of decline will be alarming. In 2017 he allowed just 57.4 percent of passes thrown his way to be caught, and while he has only had two picks over the past two seasons, he has also allowed just 645 receiving yards across 97 targets. Newman kept a first-round pick on the bench a year ago and was still an important part of one of the league’s best defenses in 2017. Even at 39, he is worth signing for a team in need of secondary help. Tramon Williams became the answer to Arizona’s search for a quality starting cornerback opposite Patrick Peterson in 2017. After struggling for a couple of seasons at the end of his Green Bay tenure and then in Cleveland, Williams rediscovered his best play in the desert and posted an overall PFF grade of 88.8, good enough to rank ninth in the league. He allowed only 49.2 percent of passes thrown his way to be caught, and allowed a passer rating of just 58.4 over the season. For some reason Prince Amukamara can’t get any kind of love from NFL teams, but every time he plays he proves he is a legitimately solid coverage player. His overall PFF grade of 81.2 in 2017 actually represented a career high, but he had five straight seasons with a grade in the 70s – average at worst – heading into that season. 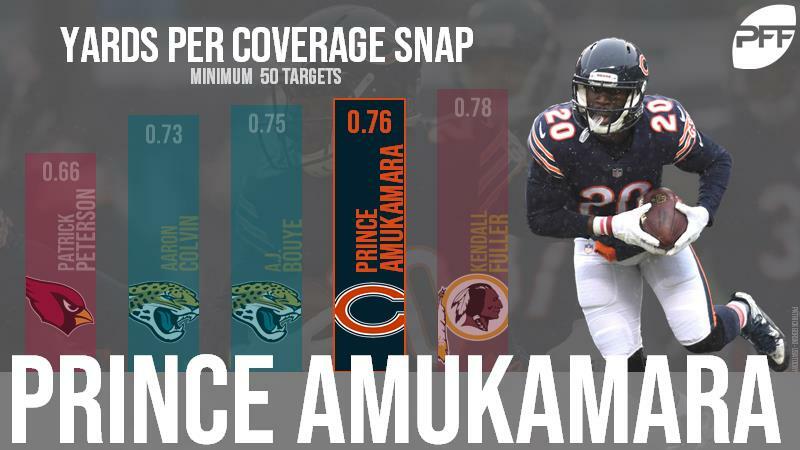 He has struggled to stay healthy at times, and as a former first-round pick, that level of play may represent a disappointing return, but in a league where there are many below average coverage players earning snaps, Amukamara should be a more sought-after player than he is. On 51 targets in 2017, he allowed just one touchdown and an average of just 11.8 yards per reception. 2017 was far from his finest level of play, but Joe Berger enjoyed the two best seasons of his career before this past year for the Vikings. He’s capable of playing either guard or center, but he looked like an All-Pro at center when he took over for an injured John Sullivan in 2015. That season, his overall PFF grade was 89.1, and he allowed just 17 total pressures over 17 games including the playoffs. Berger could come in and immediately patch up a hole on an offensive line for a team that is struggling to find competent play somewhere along the interior. Jahri Evans is another player some way into his late-career decline, but again is coming down from such a high that he still represents a capable set of hands at a spot where some teams are starting disastrous players. His overall PFF grade in 2017 was 71.7, good enough for 30th in the league, but this is a league with 64 starting guards, and many more hitting the field due to injury, so Evans can still patch up a problem spot for a team, and that could make all the difference to an offense. He allowed just two sacks and 20 additional pressures in 2017. Darren Sproles is now 34 years old and coming off a broken arm and torn ACL that ended his season. Added to the fact that he has always been a role player within an offense, and the market for him may not be very strong. Sproles can still be a dynamic matchup weapon for an offense though, and would be worthy of a roster spot for a team without a receiving threat in their backfield. In 2016, Sproles gained 1.34 yards per route run, catching 82.5 percent of the passes thrown his way and topping 50 targets and receptions for the sixth time in his career.